“I vaguely remember when I was teething. Being literate would have helped but I never received any education except the inevitable life lessons. Let me relate the sequence of events as I saw them unfold with my now dimming eyes,” he says, wincing in pain as he slowly straightens one of his legs. “My parents thrived in the Island of Pemba ages before Vasco Da Gama docked in Malindi. They arrived in this Coast long before I was born. They named me Tabibu Shahame Shamte Shakir.I was the last born to my father’s fifth wife. My forefathers and kin lived in Chwakwa, Fikirini, Gaze, Mwambao, Serasi, Kibuyuni, Mukuyuni, Funzi, Msambweni, Gazi, Kinondo, Shalishali, Marafa, Likoni and Ukunda. “For what seemed like endless stormy nights, they bravely paddled and prowled through the rough sea until one dawn the tide ushered them into Mombasa. They came in search of wires from tyres and other accessories to make fishing equipment. My forefathers never went back to Pemba. In those days, the Oman Arabs reigned in the Kenyan Coast before they were overthrown by the Mazruis. We have always known this Coast as home. We have betrothed here. My wife brought forth our sixteen babies and cuddled the infants here. When Jomo Kenyatta was a young man, I was here. I swam with Kamau Wa Ngengi–he who famously known as Jomo Kenyatta- on the sparkling back of this sea and we watched this country grow from nothing to the great nation it is now. I’m now dismissed as ‘stateless’. An organic kind of sadness which he seems to have experienced far too many times clouds his eyes, strangling his voice in his throat. His mouth moves but no words come out. His face is scribbled with worries past and worries present, and the weight of this memories seem to be too much for his frail body to handle. He is fatigued with pain, blinded by wave after wave of marginalization such that he has never seen anything that would bring him a semblance of happiness and belonging. The situation has dragged him through all nine decades this far, lashing him with poverty and a state of nonexistence where he has never held a National Identity card and called it his own. Ultimately, he has been dismissed as a Non-Kenyan, thus stateless. He neither belongs here nor there and he is forced to sit, his head against a tree, and watch the authentic citizens thrive in the glory of uhuru. He falls silent for quite some time, motionless and my heart skips a beat at the thought that he may have passed on to another world right there in his three-legged stool. My mind momentarily flees, as I place myself in Mzee Tabibu’s shoes, contrasting the otherwise privileged life I was living and one of abject poverty where I could neither afford a good education or even the basic rights of a citizen. I wondered how it would have been like to live without any supporting documents that I was indeed Kenyan and the possibility of not accessing employment opportunities. Then, amid Mzee tabibu’s silence and my rumbling thoughts, a diminutive figure struggles to lock the door to the rickety hut that was ajar all the while. The frail, elderly woman hunches closer and closer as her presence jolts Mzee Tabibu from the depths of his silence. ‘If only there is something that can wade off old age. Something like a herbal potion that would make an old woman like her romp like a calf!’ I think to myself as I watch her walk with an awkwardness that only old age can bring. The very sight of her fills me with an overwhelming sense of fear at the thought of age creeping up and wringing my bones to senility. The elderly lady finally gets to the shade where we are seated.I rise up to greet her .She sits next to her husband . “Bisini,” Mzee Tabibu clears his throat, addressing the woman. “Our great grandson here came to learn about our lives and how we have fared as the outcasts from humanity,” he adds with a chuckle which seemed to hurt his throat. 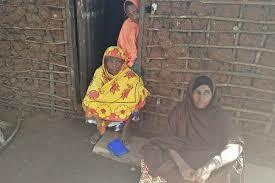 Bi Bisini, a Pemba granny dangling on her late seventies but looking decades older than that, presses a thumb on one of her nostrils and blows hard before wiping the thumb on her tattered leso. Her body posture is subdued, a manifestation of the torture her soul has undergone. The government classifies her as stateless too. She has no rights inherent to a Kenyan citizen. Veins line her arms and he neck seems to be suspended on two tendons which could collapse anytime. Her eyes look sadder than her husband’s. She relates her plight. “How has life been since?” I ask, as if I expecting it to have been any rosier. “We have been terrified ever, now we are destroyed and doomed. All our lives we have known nothing but endless agony. I remember the 60s were a tremendously trying moment for us. Like apes, we clasped on each other in the forests. The fear for our lives drove us to hide there. Slithering vipers and armies of mosquitoes kept us awake as they drained blood from our veins. Ghastly cold gnawed our bones with untold cruelty. Woe unto you if you were arrested! “We no longer hide in the forests but our lives are empty without identity. Our earnest desire is for identity as Kenyans. “For scores of years we have languished in endless misery. Our strength has faded. At this point we have nothing more to hold on to. We’ve always been deemed strangers despite living here for generations. Our unborn babies too are regarded as strangers. We are sinking deeper into misery. Grief has taken toll on us and denied us sleep. Our eyes drip with tears, day in-day out. It’s unbelievable, we have no to place to call home yet here is where we were born and now we are elderly. We plead to be lifted out of this desolation. Our faint cry has gone unheard. We enjoy no rights because of statelessness. We wallow in poverty. Our children are forever doomed to the obscurity of illiteracy. The 14 th Century was the age of discovery and a golden age in the East African coast. The coast was one belt, stretching from Zanzibar, Pemba to the present day Kenyan Coast .Vasco Da Gama, a sea farer under instructions of then Portuguese King Manuel in 1497-1499 sailed with his men on an expedition to find the shortest sea route to India. In the 15th Century the Oman Arabs arrived and deposed the Portuguese. The Omans were shortly after deposed by Mazruis and The Mazrui dynasty was thus established. The Mazruis were in a position of leadership for long. When Christian missionaries came with a Bible and a gun in the early 1900, the Islam converts- forefathers of the Pemba people- were moving freely and trading along the East African Coastal belt, some permanently settling on the Kenyan Coast but they are ‘stateless’ and are afflicted by untold squalor.